Both phones have a plastic body, Realme 2 comes with a diamond cut finish which looks much better than Redmi 6 Design. Redmi 6 has a 5.45-inch (1440 × 720 pixels) HD+ 18:9 2.5D curved glass display whereas Realme 2 has 6.2-inch HD+ 19:9 Notch Display. Redmi 6 is powered by Octa-Core MediaTek Helio P22 (MT6762) 12nm processor with 650MHz IMG PowerVR GE8320 GPU compared to Octa-Core Snapdragon 450 14nm Mobile Platform with Adreno 506 GPU on Realme 2 both phones have similar performance and has support for Dual VoLTE. 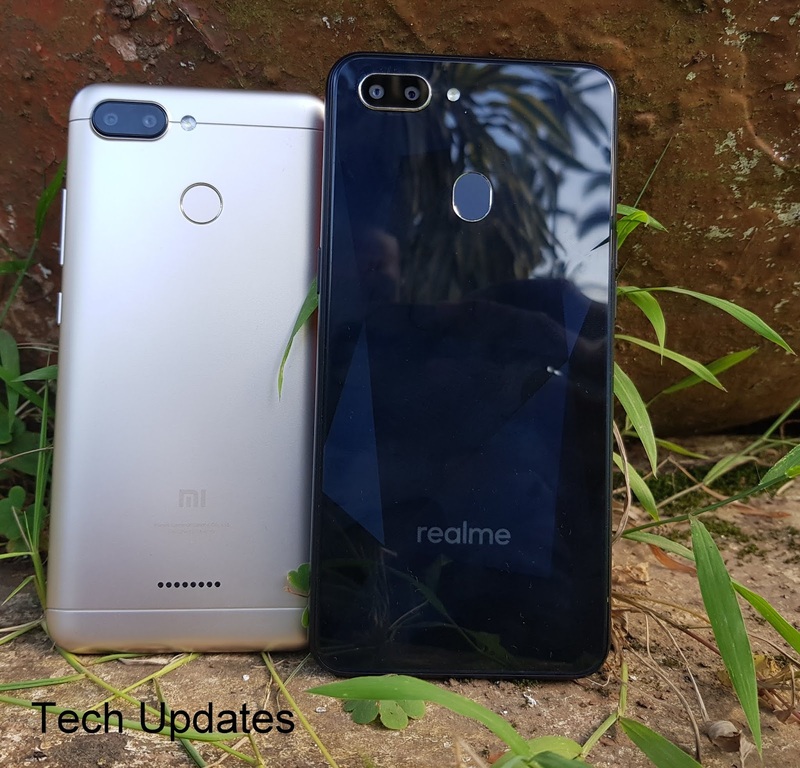 Redmi 6 comes with 3GB RAM and 32/64GB internal storage whereas Realme 2 come with 3/4GB RAM and 32/64GB Storage both come with Dedicated MicroSD card Slot. In terms of Camera, Redmi 6 has a 12MP rear camera with LED Flash, 1.25μm pixel size, secondary 5MP camera, and 5MP front-facing camera, Rear Camera has support for EIS. Realme 2 comes with 13MP rear camera with LED flash, f/2.2 aperture, secondary 2MP camera with a f/2.4 aperture and 8MP front-facing camera, f/2.2 aperture, 1.12μm pixel size. Both phones can record 1080P Videos and Support for portrait mode on front & Rear Camera. Redmi 6 has better low light camera whereas front camera is better on Realme 2. Both phones have a fingerprint scanner on the rear and Face unlock support. Xiaomi Redmi 6 has 3000mAh battery whereas Realme 2 is packed by 4230mAh Battery. Both phones run on Android 8.1 Oreo with their own Custom UI. Xiaomi Redmi 6 comes in Black, Rose Gold, Blue, and Gold colors for Rs 7,999 for 32GB Storage and Rs 9499 for 64GB Storage. Realme 2 come in Diamond Red, Black, and Blue color priced at Rs 9499 for 3GB RAM and Rs 10,990 for 4GB RAM. 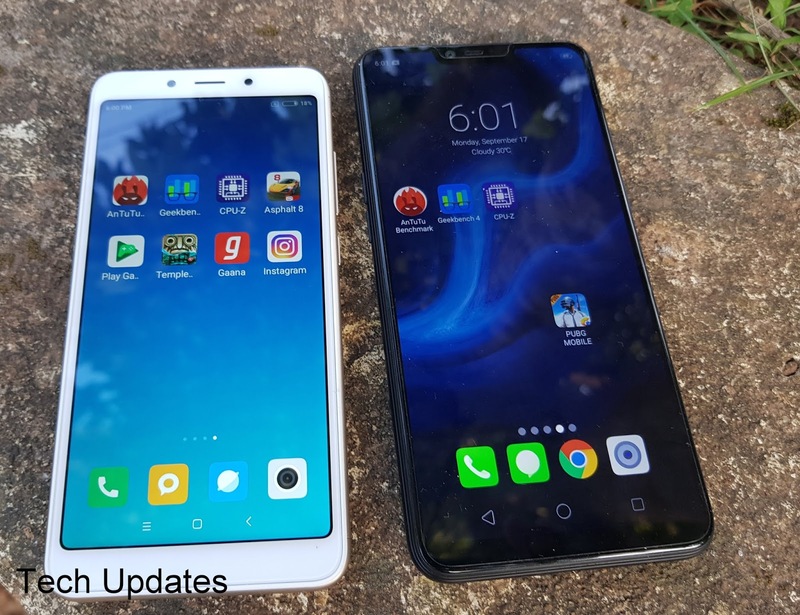 Realme 2 offers Notch Display, Bigger Battery, Better front Camera, and Similar performance.